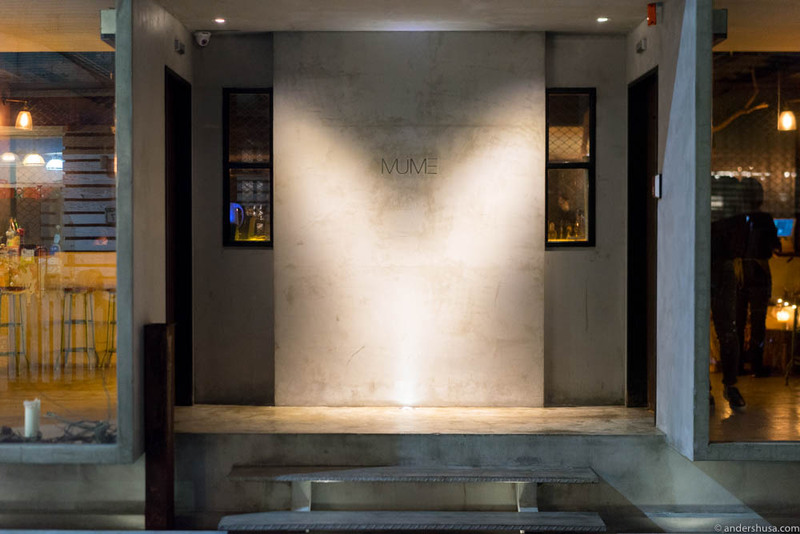 Mume was the only restaurant where I actually had a table booked in advance, for our recent trip to Taipei in Taiwan. If you follow me on Instagram you might have seen some updates from our journey already, and if you plan a trip yourself I recommend to check out my foodie map of favorite spots in Taipei. My only goal in Taipei was to check out the amazing street food scene the city has to offer – and Mume. 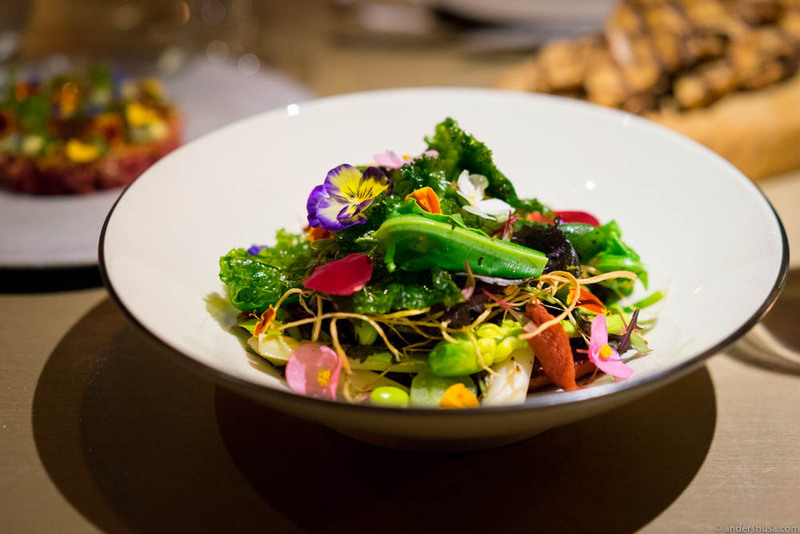 Even though Mume is as far away from a street vendor as you can get, with their concept of a modern European casual fine dining restaurant, they’re still a reflection of the country through their use of local and seasonal produce. 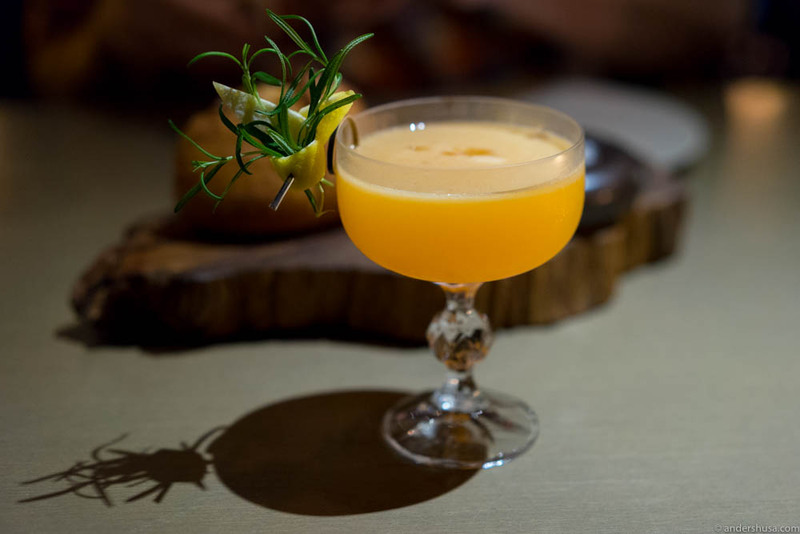 Mume was established in late 2014 by three young chefs with unique experience from high-end restaurants around the world. 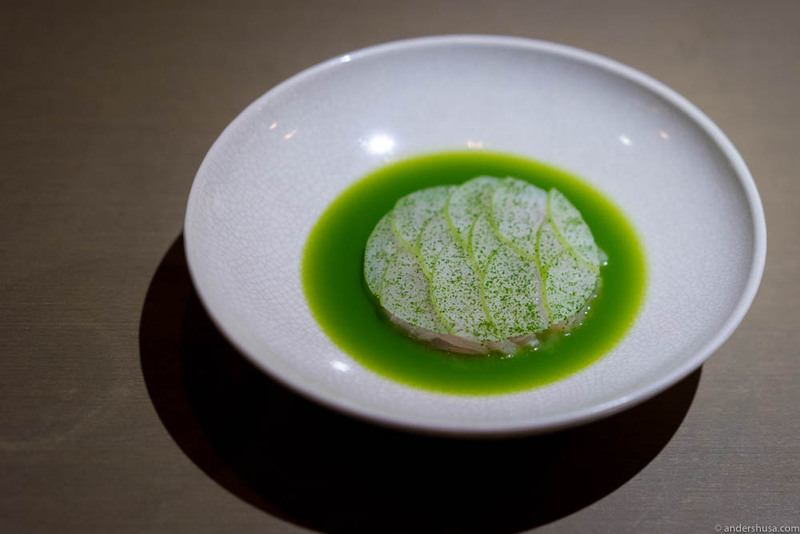 Richie Lin, originally from Hong Kong, had worked at two-Michelin-starred and four times World’s Best Restaurant Noma in Copenhagen. 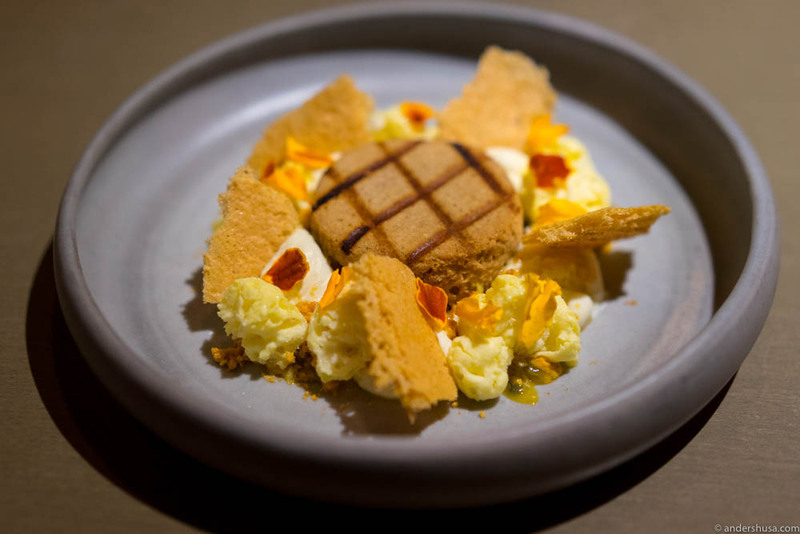 Australian Kai Ward gathered his valuable experience from Sydney’s flagship restaurant Quay, and lastly, Long Xiong who previously cooked at three-Michelin-starred restaurant Per Se in New York. If you follow foodies for inspiration on Instagram you may also know the sister of chef Richie Lin: @little_meg_siu_meg. If not, I highly recommend that you start following her now. I was in Taipei to visit my brother, Fredrik, who studies Chinese. Hedda and I traveled together with my parents and my youngest brother Kristian, and we arrived just in time to celebrate New Year’s Eve with spectacular fireworks from Taipei 101. Up until our visit to Mume on January 5th, our meals were dominated by more traditional food: A lot of dumplings, steam buns, beef noodles, Chinese pancakes, potstickers, and hot pots. Not that there’s anything wrong with that, I loved the local Taiwanese food, but just like you get a bit tired of pasta and cheese in Italy it was a welcoming sight to see oysters and cocktails on the menu at Mume. Mini tartlets. On the right: sweet peas & sugar snap in lovage oil, ricotta and candied yuzu in a roasted kombu tart shell. On the left: kiwi puree, pickled green tomatoes, sea asparagus, creme fraiche and fried nori in a soy tart shell. Loved the haircut on this guy! 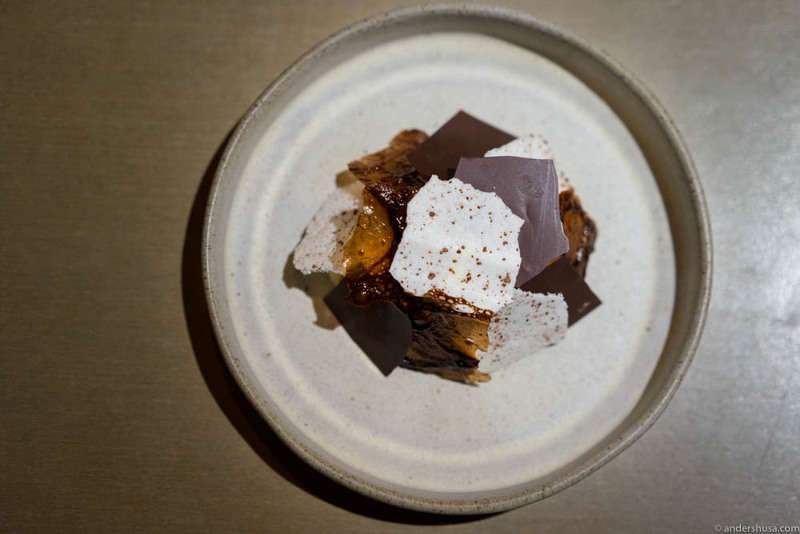 The menu at Mume is divided into four sections: snacks, smaller, bigger, sweeter. Apparently, they used to offer tasting menus, but now it’s just à la carte. Our lovely waiter explained how everything worked and gave us a suggestion on how many dishes we should order. Since we were a party of six, she figured we could almost go through the entire menu if we were set on sharing stuff. I love to share plates and taste as much as possible, and luckily the rest of the table agreed. However, we began by ordering all the snacks and smaller dishes but waited with the bigger and sweeter stuff. That turned out to be a good strategy. Ice cold smoked ricotta snow! From start to finish, the dishes that came out from Mume’s kitchen was as much of a pleasure to look at as they were tasty and delicious. 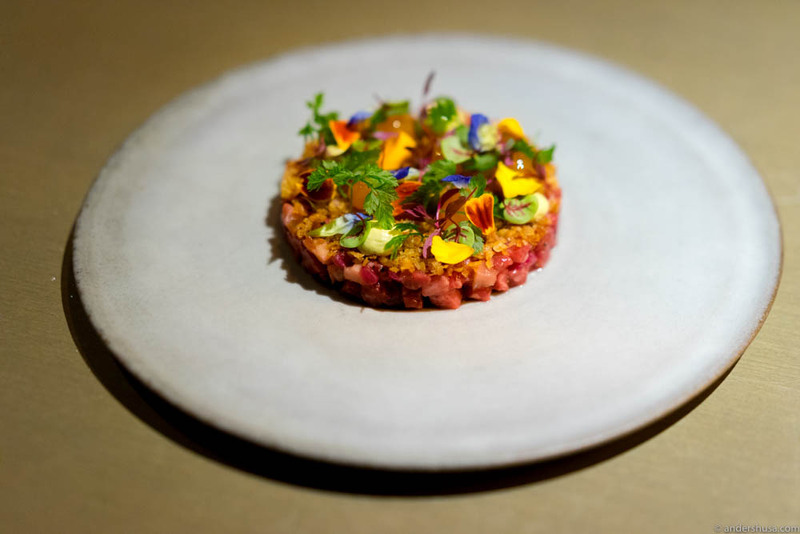 From the ice cold poached oysters with a citrusy granita to classics on the menu like the wagyu tartare. 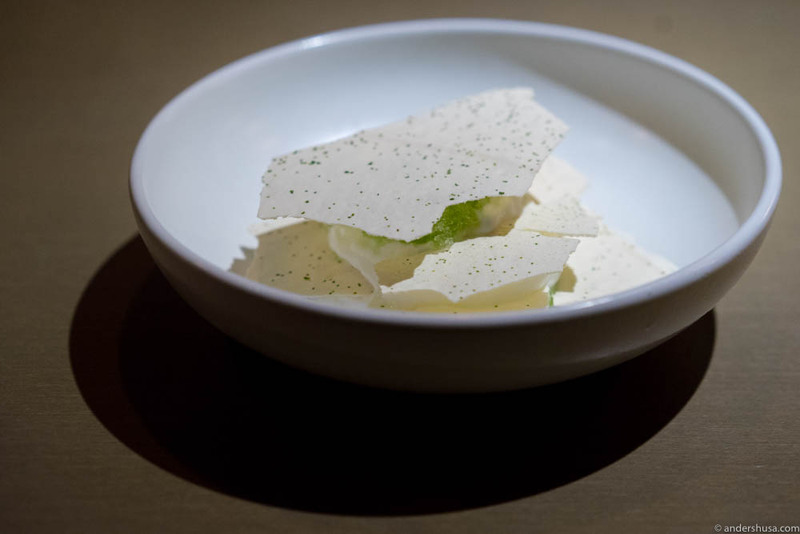 Even the sourdough bread serving with two different butters – beer and smoked beef fat – was a great dish on its own. 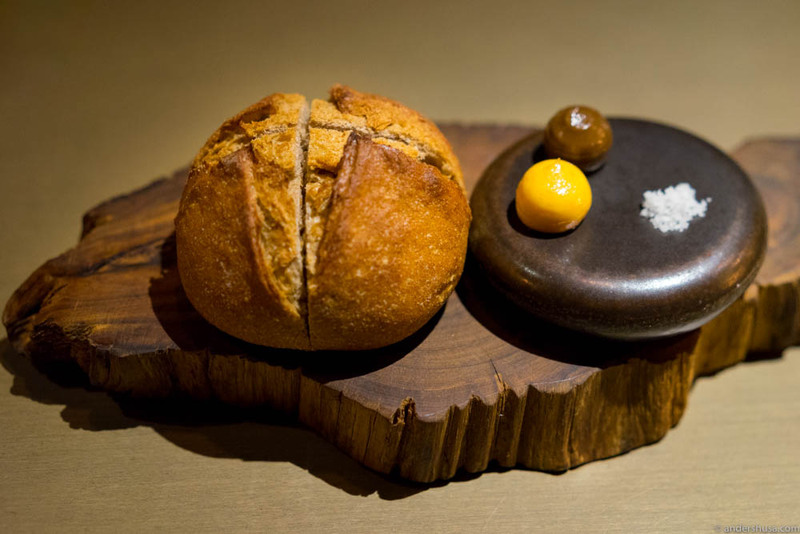 I think the bread inspiration was clearly from Noma, and the same goes for the small tartlets we got as appetizers. The mini tartlets may look innocent, but they were, in fact, small flavor bombs. The favorite course by almost everyone around the table this night was the Mume salad. I asked chef Ward, who served the salad if it was inspired by a recent visit from Zaiyu Hasegawa of restaurant DEN in Tokyo. Kai confirmed that indeed it was a result of their cooperation, but of course, Mume made their own version with local Taiwanese, seasonal vegetables. 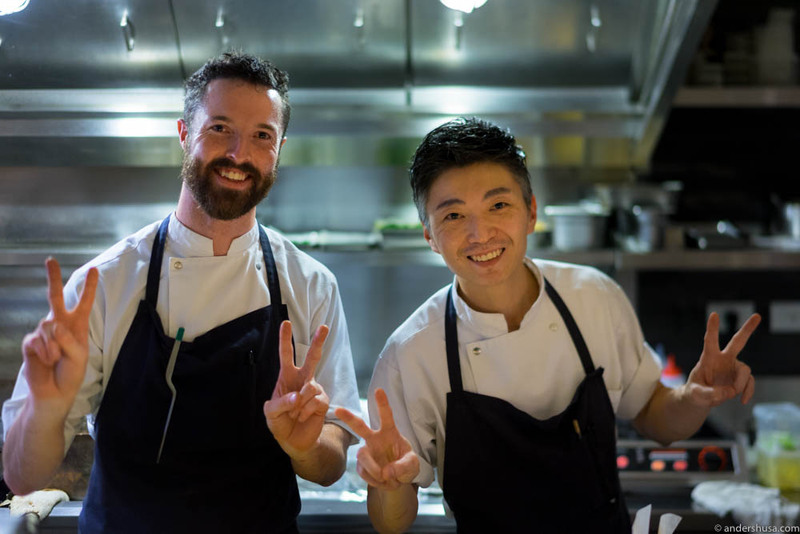 I haven’t been to DEN yet myself, but I met Zaiyu and his team when I was at Noma Australia. They are wonderful people and DEN will definitely be my first stop in the Japanese capital – hopefully, this year. 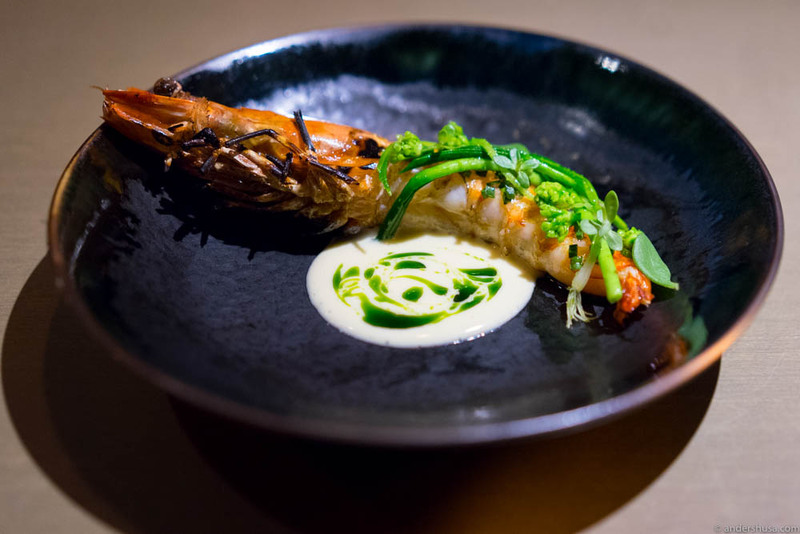 An off-menu item: Local tiger prawn char-grilled with rosemary & pawn butter from its own shell, served with three different types of chives, lemon beurre blanc and parsley & rosemary oil. It may seem silly for Scandinavians to visit a modern European restaurant when we are in a far away country known for its street food. 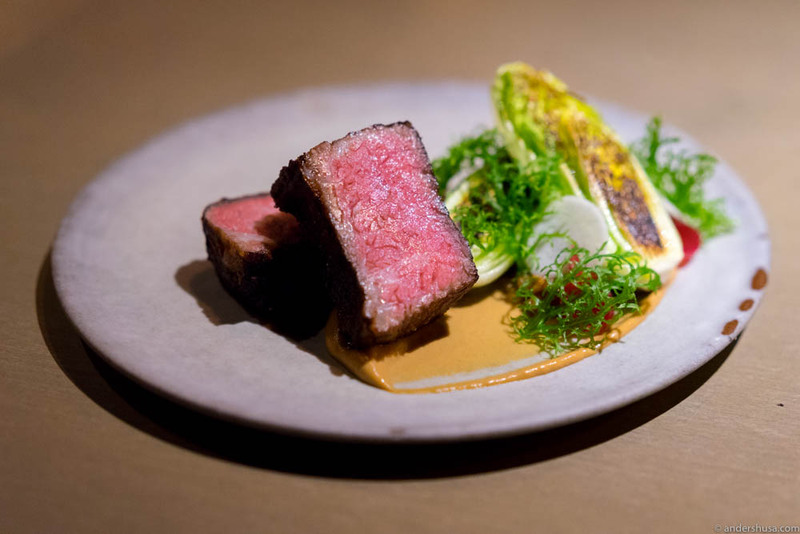 Well, I am happy to say that we certainly didn’t regret our reservation at Mume. On the contrary, it was one of the best nights of our visit. Friendly service, a good ambiance, chefs who took the time to explain each course and even spent some decent time at our table just chatting and talking and exchanging restaurant recommendations. Taiwanese food has a lot of punch and flavor in each dish, and I feel Mume managed to stay true to that element, even if the chefs developed the local ingredients after looking through a Danish lens or an Australian objective for quite some time. 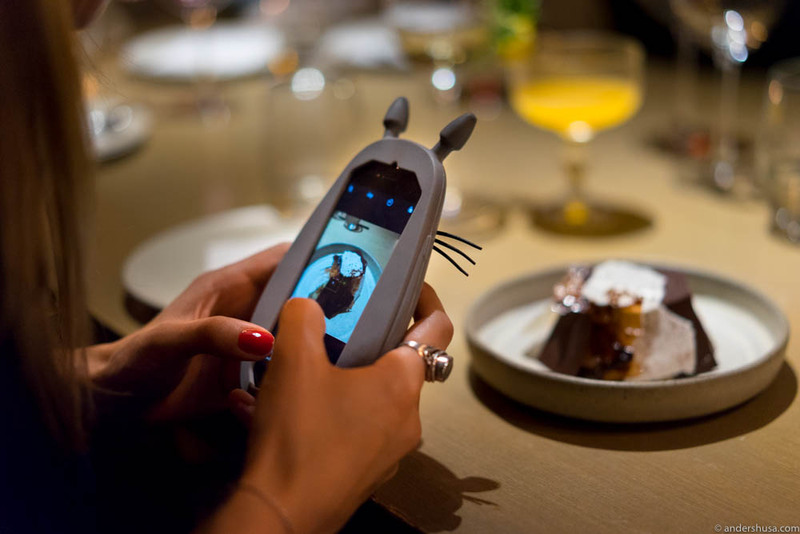 I guess that’s what the Mume experience is all about: bringing some innovativeness into a super-traditional food culture. By the time we finished all the smaller dishes and snacks, I wasn’t sure if we need to order any main course before the desserts. Personally, I barely had room for any more food, but my father and brothers had their minds set on some more meat. In the end, I was happy we got the BBQ pork ribs in particular. With meat that fell off the bone, and a sweet and savory plum and miso glaze, it was one of the meal highlights. Funnily, my youngest brother found the small coconut & lime palate cleanser we were served before desserts to be his favorite dish of the entire dinner. The desserts were good too, but not the highlights of the meal on my part. In particular, the smoked vanilla ice cream wasn’t much of a success around the table. It sounds weird, but the smokiness almost gave the dish an umami taste, which doesn’t fit a sweet serving too much. Besides that, I believe every plate was licked clean this night, and it was a highly satisfied family that walked out of Mume and back onto the streets of Taipei in the Da’an District. Mume is a must-visit if you find yourself in this part of the world. 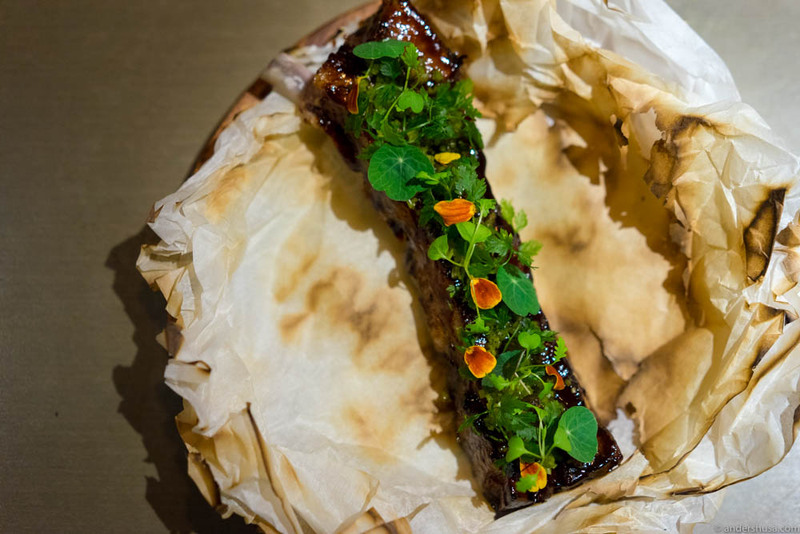 Have you been to Mume or another high-end restaurant in Taipei? Please share your experience in a comment below. This has to be one of my worst dining experiences ever! 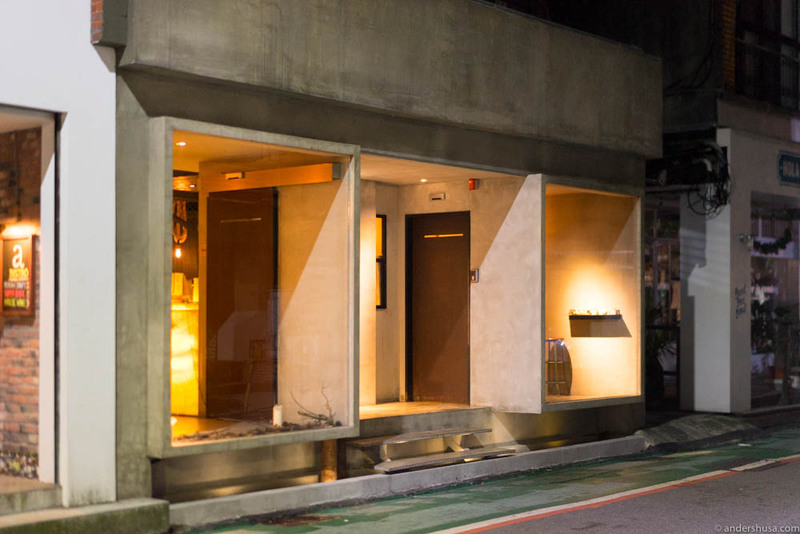 My friend and I went to Taipei solely because we managed to make a reservation in MUME, but the whole dining experience turned out to be a real disappointment and letdown. We reserved our table for the 8:30pm seating since it’s the only time that they serve the longer menu (8-10 courses). We arrived at 8:25pm, told the waiter the reservation is booked under Ms. Lxx, we were then shown to the waiting area. A waitress came over 5mins later and asked if we’ve booked under Mr. xxxxxxxx(which was a non-Chinese last name), my friend looks Chinese hence it’s unlikely that this would be his last name, I feel that this is quite unprofessional. After we had been placed at our table (around 8:30), it took around 30 minutes for us to receive our first dish. The menu was set and we had to pre-order, so I’m not sure why it took them so long to prepare the appetizer – “seasonal tartlets”, they’re not even delicate. We were given 2 different tartlets, one with beans and the other one with Yuzu. The tartlet with beans was very salty, there was cheese in it but it shouldn’t be very salty. The tartlet with Yuzu was very oily, its meant to be a fruit, it shouldn’t have been oily like this! Second dish was a gazpacho, with Prawn and Jicama, the soup was very oily, I think they put too much dill oil in it. Next was the Wagyu tartare with daikon and egg yolk, since it was a supplement dish, we only ordered 1 serving to be shared among us. We really struggled to taste the beef flavour despite it being wagyu beef, it was very salty and the overall taste of the dish was like any regular Taiwanese instant noodle flavour, hardly what you would expect from a Michelin restaurant. I’m not sure whether I would classify it as molecular gastronomy dish or a complete failure. The sourdough came with beef butter, it didn’t taste good and it was very dense. I feel any bakery could do better on the sourdough. Leads me to wonder if they order the bread elsewhere and serve it as their own. The beef butter, however, did have a good beef fragrance about it. Next came, milkfish with kohirabi. The fish was ABSOLUTELY SALTY. They’ve probably put salt on it 3 times?! So I removed the skin and it was better, but it’s still salty. The rest of the sauce is just average. We waited over 20minutes for the next dish. It was 10pm already. So we asked the waitress if this is normal in their restaurant or if some unforeseen circumstance had happened on the day. She told us they have a private group who came in late and the kitchen wasn’t able to cope with the demands of this group , hence, everything was delayed. This shouldn’t be our problem I’m afraid and we told them that we should be served fairly and not overlooked due to other dinners being late for their booking, her response was that they are trying their best but the kitchen is having some problems. Honestly, the size of the restaurant is fairly small and there were only 2 different courses of meals one can pick from. How hard is it for them to manage the food? Can this even be called a fine dining restaurant? The manager ‘apologised’ by saying “ we don’t ask for your sympathy, it’s our own problem”, and then what? I don’t even view this as an apology, it’s more a confirmation of the current start of affairs. I find this unacceptable, and do question her credentials for running such a prestigious restaurant. By the time the pigeon came, it was 10:30pm, it came with beet and roselle. My serving was bloody, there was still blood on the pigeon, so I asked the waitress and she said it’s supposed to be 30% cooked and mine does look a bit too raw so she took the dish back and asked the kitchen to redo it. The roselle sauce was very sour, I wonder if they tasted it before serving. There was another long wait for the main dish, it only came around 11:15pm. The main dish was the ox tongue, the portion was so small, I can’t understand how it can be called the main dish, there’s no difference from any other pan-fried ox tongue. This dish is another big disappointment. The dessert was cucumber slush. It was super sour, can’t imagine how anyone can make anything like this. The other dessert is pineapple, mango and coconut milk. In general the restaurant is very small and noisy, I could barely hear my friend, so when the waitress came and explained our dishes, we could only hear half of it. The final straw I think came by the fact that there were flie/s in the restaurant and we kept seeing it/them all night, even though we told the waitress about it no one seemed that bothered. Summing up – the whole dinner ‘experience’ lasted from 8:30-midnight and we weren’t even full so we had to go for another meal. It’s the worst “fine dining” experience I’ve ever had. Total price of the course is TWD3680, with the whole experience, this is totally overpriced, wasn’t worth the price and time. In the end, the manager waived the charges of our drinks after our complaint, that was only 2 bottles of water and 1 drink. We were hoping for a proper apology when the bill came, but there was nothing, so we paid and left. The service and her attitude is not just unprofessional but it is also unacceptable too. Also, despite the fact that we’ve posted this on FB and IG, there’s been no response from the restaurant, you would think that they would try to defend themselves, but nothing. I feel this further adds to their arrogance and dismissal of customers genuine concerns/feedback. Sorry to hear about your bad experience, Jennifer. Hard for me to comment on it since I wasn’t there, and my experience was quite the opposite. It sounds like the restaurant had a bad day, but they may not have handled it in the best way. Perhaps they will find your comment here and reply.